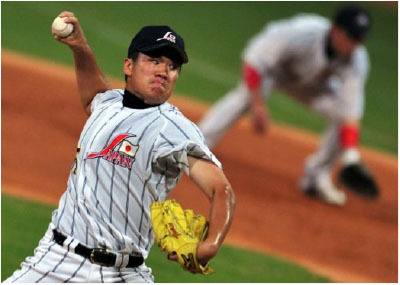 The newest New York Yankee, Japan's Masahiro Tanaka, has a distinguished history of playing in IBAF sanctioned events. Nippon Professional Baseball’s (NPB) Masahiro Tanaka has agreed to an international player transfer to Major League Baseball’s (MLB) New York Yankees club for $155 million USD over 7-years, amounting to a record contract for the acquisition of an international free agent. Tanaka’s international baseball curriculum vitae includes being a member of Samurai Japan’s gold-medal team at the IBAF Asia’s 2005 18U Asian Championship. The 25-year-old Tanaka was also member of Japan’s 2008 Olympic team in Beijing, China. In 2009, he achieved gold again with Team Japan at the 2nd World Baseball Classic. He last represented his country at the 3rd World Baseball Classic last year. As part of the international transfer agreement between MLB and NPB, the Yankees will be required to pay a $20 million transfer fee to Tanaka’s former team with whom he was still under contract, the 2013 NPB champions Rakuten Eagles. Rakuten announced on Dec. 24th that they would allow the star to explore the global baseball market. The 30-day international trade window was set to close tomorrow at 5 p.m. eastern standard time. To help accommodate the transfer and ease the cultural transition from Japan to New York, the Yankees will extend Tanaka a one-time $35,000 moving allowance and an annual $100,000 housing allowance. The Yankees will also allow Tanaka to shop around (up to $85,000/annually) for a personal interpreter. Additionally, Tanaka will be granted four first-class roundtrip tickets to travel between New York and home country Japan.